Kwikset provides a line of locksets called Ultramax (formerly Titan), that allows you to change the lock cylinder without removing the lockset from the door. The Ultramax line is available for deadbolts as well as entry knobsets. 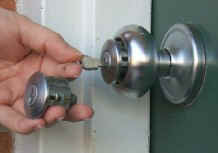 These products are available from Home Depot Supply (800-431-3000 or www.hdsupply.com) or from Landlord Locks (800-847-8729 or www.landlordlocks.com). This is a great solution for multi-unit properties; Home Depot supply will set up a master key system for you; Landlord Locks will even setup a master key system for you, and re-key your old cylinders for a small fee. Here's how to change Ultramax knobset cylinders (instructions courtesy of Landlord Locks). ...and pull gently. The cylinder will follow the key out of the knob. Then, simply insert the master/control key into the new cylinder and rotate the key 1/4th turn counterclockwise. Slide the new cylinder into the knob and turn the master/control key 1/4th turn clockwise to the 12:00 o'clock position and remove the master/control key. Deadbolt cylinders are changed in a similar manner (instructions courtesy of Kwikset Corporation). Insert the master/control l key and turn it 1200 (slightly more than 1/4 turn) counterclockwise. Pull the cylinder assembly straight out. Turn the key back to the vertical position and remove it. Insert the master/control key into new cylinder and rotate about 1200 counterclockwise until locking bar is flush with the cylinder body. Look into the cylinder hole to observe the orientation required for the tailpiece. Rotate the tailpiece accordingly. Insert cylinder assembly into deadbolt. Turn clockwise to the 12:00 o'clock position and remove the master/control key. Initially, this solution is more costly than the standard locksets, but the long-term savings could be substantial. My suggestion is to use a separate master key system for each property; this way, when you sell one of your properties you aren't giving away the keys to all your other properties.